The City of Côte Saint-Luc adopted an operating budget for 2017 that kept spending flat and the property tax at at 1.9% percent for an average single-family home in the city. This is in line with the Conference Board of Canada inflation rate forecast for the greater Montreal region. “The Council and senior staff worked very hard to balance our budget and to minimize any property tax increases for our residents,” said Councillor Steven Erdelyi, the council member responsible for finances. The three-year capital expenditures plan was also adopted on December 12. Approximately $14 million in capital expenses is anticipated in 2017. It will be used for projects such as water and sewer rehabilitation and repairs, renovations to the outdoor municipal pool, underpasses, improvements of facilities and parks and updating the aging vehicles in the municipal fleet. The City of Côte Saint-Luc has adopted an operating budget for 2016 that kept spending flat and saw the property tax of 2.3 percent for an average single-family home in the city, which is in line with what the Conference Board of Canada has forecast as the inflation rate for the greater Montreal region. The Côte Saint-Luc City Council adopted the $67 million operating budget on December 14, 2015. About 42 percent of all taxes collected by Côte Saint-Luc are transferred to the Agglomeration of Montreal, which is the island-wide regional government that funds services such as police, fire, and public transit. The property tax bills will be sent to homes by the last week of January. The deadline to pay property taxes has been set at February 26 for the first installment and May 27 for the second installment. The three-year capital expenditures plan was also adopted on December 14. Approximately $10.5 million in capital expenses is anticipated in 2016. It will be used for projects such as enhancements to Pierre Elliott Trudeau Park, improvements and repairs to the Westminster and Cavendish underpasses, repairs to municipal buildings including the Bernard Lang Civic Centre building envelope, repairs to roads and sidewalks and more. At last night’s public meeting, Côte Saint-Luc City Council adopted its 2013 budget for local and agglomeration operating expenses. An average single family home (valued at $470,000) will see a modest increase of $78 in taxes or 1.32 percent, well below the rate of inflation. 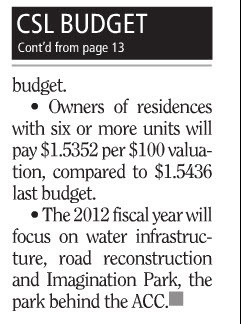 The total budget amounts to $65M which breaks down as $37M in local costs and $28M in island wide agglomeration costs. The City will continue to invest in critical infrastructure (water distribution network, roads, sidewalks, etc.) as well as in rejuvenating its oldest park equipment. As Councillor responsible for Public Safety I am quite pleased that the city will continue its important investments in this area ensuring top quality volunteer EMS response, the steady expansion of the volunteer Citizens on Patrol as well as Public Security, Emergency Communications and Emergency Preparedness. Also, the CSL Cycles program will continue to roll out with new bike lanes stretching from Cavendish, along Baily toward the Cote Saint-Luc Shopping Centre, to tie in to the NDG network running up West Broadway. A new lane will also be painted along Kildare Road from Westminster to Shalom and through Ruth Kovac Park to reach the Cavendish Mall. Unfortunately, Cote Saint-Luc is obliged to spend about half-a-million dollars on the Montreal Metropolitan Community, an added level of regional government for which we have very little input and see very questionable results. I concur with the Gazette’s civic affairs columnist Henry Aubin who has argued for years that the Montreal region is overburdened with layers of bureaucracy from multiple transit authorities, government departments and agencies, all adding to our tax burden at one level or another. Fortunately, with the municipal demergers in 2005, Cote Saint-Luc controls well over half its local taxes and sets priorities locally on services closest to the resident. Here is a detailed copy of the CSL 2013 budget presentation. 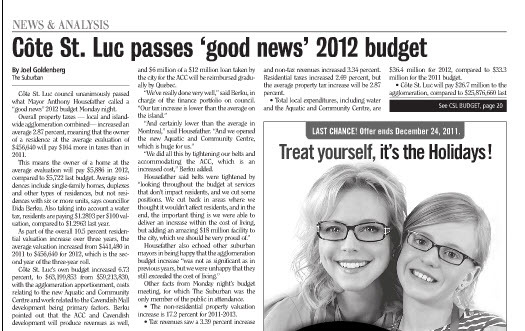 Côte St. Luc is expecting a surplus by the end of 2010, based on results from the third quarter of its financial year, Mayor Anthony Housefather said in his annual report on the city’s finances. Housefather said the city would keep close control over expenses while still providing a high quality of service. Housefather added that operating expenses are within budget, also according to third quarter results. The report also said Côte St. Luc had some cost increases because of changes in the payment of vacations, sick days and overtime for employees. “However, due to better overall efficiency and cash-flow management, the city has also experienced some savings in various areas such as snow clearing operations which offset these costs,” Housefather said, referring to the relatively light snowfall last winter. • A balance between revenues and expenditures. • That property taxes do not increase beyond the rate of inflation. • Ensuring long-term financial viability of the city. • Ensure that the cost of debt service does not exceed 15 percent of the overall local operating budget. • Paying particular attention to the establishment of the Aquatic and Community Centre’s first operating budget. (Housefather announced during the meeting that the Intergenerational Aquatic Centre’s name has been changed to the Aquatic and Community Centre). “We will continue to run the city like a business, focusing on waste management programs, improvements in our water infrastructure system, and providing innovative recreational and cultural programs that suit the needs of city residents,” the mayor said.